Sea level rise leads to coastal transgression, and the survival of ecosystems depends on their ability to migrate inland faster than they erode and submerge. We compared marsh extent between nineteenth-century maps and modern aerial photographs across the Chesapeake Bay, the largest estuary in North America, and found that Chesapeake marshes have maintained their spatial extent despite relative sea level rise rates that are among the fastest in the world. In the mapped region (i.e., 25% of modern Chesapeake Bay marshland), 94 km2 of marsh was lost primarily to shoreline erosion, whereas 101 km2 of marsh was created by upland drowning. Simple projections over the entire Chesapeake region suggest that approximately 100,000 acres (400 km2) of uplands have converted to wetlands and that about a third of all present-day marsh was created by drowning of upland ecosystems since the late nineteenth century. Marsh migration rates were weakly correlated with topographic slope and the amount of development of adjacent uplands, suggesting that additional processes may also be important. Nevertheless, our results emphasize that the location of coastal ecosystems changes rapidly on century timescales and that sea level rise does not necessarily lead to overall habitat loss. The online version of this article ( https://doi.org/10.1007/s12237-017-0336-9) contains supplementary material, which is available to authorized users. The Dominion Foundation, NSF Coastal SEES 1426981, NSF LTER 1237733, NSF CAREER 1654374, U.S. Department of Energy Terrestrial Ecosystem Science Program, and the USGS Climate and Land Use Dynamics Program funded this project. We would like to thank David Wilcox, Madison Clapsaddle, VIMS Center for Coastal Resources Management and VIMS Shoreline Studies programs, and the Chesapeake Bay National Estuarine Research Reserve System for assistance with the GIS analyses. This is contribution number 3676 of the Virginia Institute of Marine Science. Anisfeld, S.C., K.R. Cooper, and A.C. Kemp. 2017. Upslope development of a tidal marsh as a function of upland land use. Global Change Biology 23, 755–766. https://doi.org/10.1111/gcb.13398. Beckett, L.H., A.H. Baldwin, and M.S. Kearney. 2016. Tidal marshes across a Chesapeake Bay subestuary are not keeping up with sea-level rise. PLoS ONE 11(7): e0159753. https://doi.org/10.1371/journal.pone.0159753. Byrn, R.J., and G.L. Anderson. 1978. Shoreline erosion in tidewater Virginia. Special Report in Applied Marine Science and Ocean Engineering 111, Virginia Institute of Marine Science, Gloucester Pt, VA, 102. http://ccrm.vims.edu/gis_data_maps/shoreline_inventories/virginia/scan_reports/TidewaterShorelineErosion.pdf. Cadol, D., A. Elmore, S. Guinn, K.A.M. Engelhardt, and G. Sanders. 2016. Modeled tradeoffs between developed land protection and tidal habitat maintenance during rising sea levels. PLoS ONE 11(10): e0164875. https://doi.org/10.1371/journal.pone.0164875. Chesapeake Bay Program: Tidal wetland abundance. 2015.http://www.chesapeakebay.net/indicators/indicator/tidal_wetlands_abundance. Collins, B.D., and A.J. Sheikh. 2005. Historical reconstruction, classification and change analysis of Puget Sound tidal marshes. Puget Sound River History Project Report to: Washington Department of Natural Resources. http://www.pugetsoundnearshore.org/supporting_documents/historical_shoreline_dnr.pdf. Corbett, D.R., J.P. Walsh, S.R. Riggs, D.V. Ames, and S.J. Culver. 2008. Shoreline change within the Albemarle-Pamlico estuarine system, North Carolina. 1907–2007 Centennial. https://www.ecu.edu/cs-acad/icsp/upload/EstuarineShorelineChangeDec2008.pdf. ESRGC: Eastern Shore Regional GIS Cooperative LiDAR Services. 2015. http://lidar.salisbury.edu/arcgis/rest/services/DEM_ft. Ezer, T., and W.B. Corlett. 2012. Is sea level rise accelerating in the Chesapeake Bay? A demonstration of a novel new approach for analyzing sea level data. Geophysical Research Letters 39, L19605. https://doi.org/10.1029/2012GL053435. Feagin, R., M. Martinez, G. Mendoza-Gonzalez, and R. Costanza. 2010. 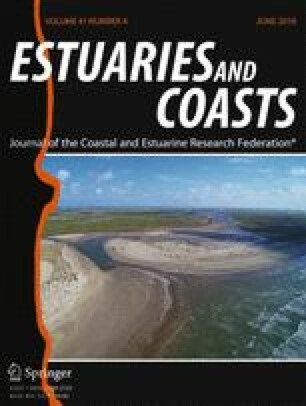 Salt marsh zonal migration and ecosystem service change in response to global sea level rise: A case study from an urban region. Ecology and Society 15(4): 14. [online] URL: http://www.ecologyandsociety.org/vol15/iss4/art14/. Glick, P., J. Clough, and B. Nunley. 2008. Sea-level rise and coastal habitats in the Chesapeake Bay region. Technical Report. National Wildlife Federation. https://www.nwf.org/media/PDFs/Global-Warming/Reports/SeaLevelRiseandCoastalHabitats_ChesapeakeRegion.ashx. Kirwan, M.L., G.R. Guntenspergen, A. D’Alpaos, J.T. Morris, S.M. Mudd, and S. Temmerman. 2010. Limits on the adaptability of coastal marshes to rising sea level. Geophysical Research Letters 37: L23401. https://doi.org/10.1029/2010GL045489. Marani, M., A. D’Alpaos, S. Lanzoni, and M. Santalucia. 2011. Understanding and predicting wave erosion of marsh edges. Geophysical Research Letters 38: L21401. https://doi.org/10.1029/2011GL048995. Mariotti, G., and S. Fagherazzi. 2010. A numerical model for the coupled long-term evolution of salt marshes and tidal flats. Journal of Geophysical Research 115, F01004. https://doi.org/10.1029/2009JF001326. Multi-Resolution Land Characteristics Consortium. 2016. http://www.mrlc.gov/nlcd2011.php. NOAA. NOAA Shoreline Website: NOAA Historical Surveys (T-Sheets). 2015. https://shoreline.noaa.gov/intro/. Silliman, B., P. Dixon, C. Wobus, Q. He, P. Daleo, B. Hughes, J. Willis, and M. Hester. 2016. Thresholds in marsh resilience to the Deepwater Horizon oil spill. Scientific Reports 6: 32520. https://doi.org/10.1038/srep32520. Smith, J.A.M. 2013. The role of Phragmites australis in mediating inland salt marsh migration in a Mid-Atlantic Estuary. PLoS ONE 8(5): e65091. https://doi.org/10.1371/journal.pone.0065091.